All aboard to one of Prague’s finest new playgrounds featuring a two-carriage tram complete with it’s own musical instruments! This super new playground is set deep in Stromovka’s beautiful woods and sits alongside the old tram depot, now nicely converted into a decent outdoor restaurant. The playground has been here for years but was rather sad looking when compared to some of the playgrounds that have sprung up around town. Now I can safely say that it is the best this side of the river and makes a visit to Stromovka with kids really worthwhile. 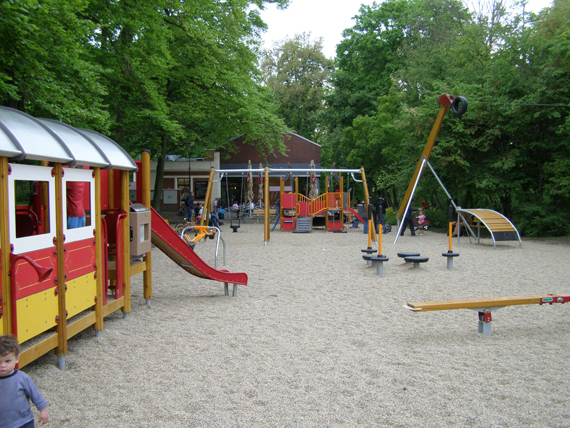 There is lots of different equipment for all ages including a big range of climbing frames for big and little kids plus the usual swings, see-saws, a great zip line and balance beams, spinning things etc. etc. Obviously the tram is quite an attraction and relates back to the fact that the playground now sits on old tram tracks that would once carry trams to the tram depot. The tram is full of fun surprises for the kids, they can climb all over it, use a tunnel to move carriages, check out the view through a telescope, slide down off the tram, communicate through the pipes and play the various instruments - including built in chimes! Plenty to keep their minds active and entertained. The setting is gorgeous, you feel miles from the traffic and chaos of the street, yet if you need a pick me up in the form of food or drink then the restaurant is great. There is a decent amount of seating indoors and outdoors although this place does get busy on the weekends. I’ve visited it only on weekends but have heard that on weekdays it’s really quiet. I have to say that despite the crowds we have always experienced good service and received our meals in reasonable time. The menu and prices have changed since I wrote about Vozovna, the prices have gone up - previously the prices were incredibly cheap for Prague. I’d still say it’s good value for money because the food is still above standard. Stromovka is a super spot, especially if you have kids learning to ride bikes or you need to stretch your legs, space or nature. We caught the number 5 tram from Zizkov straight into the park and for our return journey caught the Historical Tram which leaves every hour from Stromovka Park. My Dad is a huge tram buff so I could not deny him the rare treat of rattling through Prague across the river, through the city and then Mala Strana exiting at Malostranska Metro for a more conventional ride home. DIRECTIONS: Easiest is to take tram numbers 5, 12, 14, 15, 17 or 91 to Vystaviste tram stop. By Car: There is paid parking at Vystaviste, alternatively there is metered parking up the hill in Nad Kralovskou Odborou ul.